I am pleased to report that Atkinson Law settled two cases in December with a combined value of $1.15 million, and it earned an article in Virginia Lawyers Weekly, a statewide trade publication. It all arose out of a serious car accident on the eastern shore. My clients were making a left turn with a green arrow and a driver coming from the other direction ran a red light at a high speed. The mother-daughter pair were some of the nicest people I have ever met. After mediation concluded, I asked the mother what she would use her settlement money for. She answered that she needed some new church clothes. Nothing wrong with that! 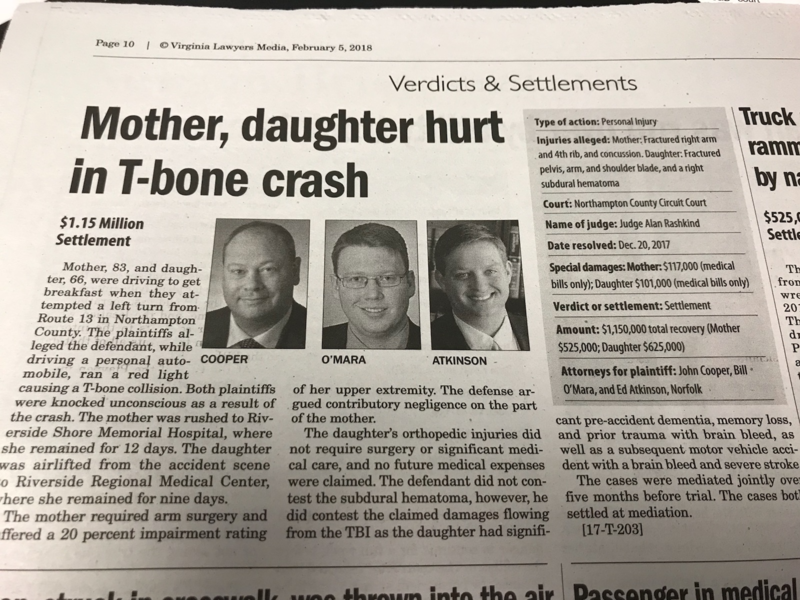 One thing this case taught me was the importance of seeking an attorney early if you are injured in a car accident. When relatives contacted me, I went to the hospital to meet the daughter in Newport News. With me was another great personal injury lawyer, Bill O’Mara, who did a huge amount of work in this matter. Attorney John Cooper was a force to be reckoned with in negotiations. I was glad he was on our side! This personal injury case marks a milestone in Atkinson Law’s growth and success. Thanks to all my clients, family, friends and colleagues who helped get us to this point. On to the next one!